Could it be colic? Know the symptoms and the proven ways to end the tears. If your newborn fusses and cries sometimes for hours on end, then you, too, may have a case of colic on your hands; up to 26 percent of babies get this diagnosis. Colic usually starts at 2 weeks, peaks at 6 weeks, and is gone by 16 weeks. It’s long been defined as unexplained crying for more than three hours a day, at least three days a week, for three weeks or more—but this is just a rule of thumb, and your infant doesn’t need to meet these exact criteria to be considered colicky. 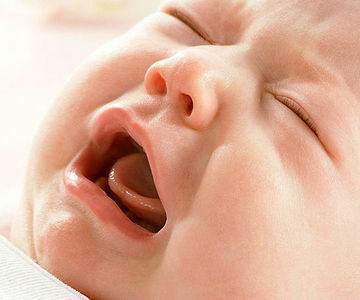 Although it’s true that all babies cry, those with colic do so with gusto. We’re talking earsplitting screams that seem to come out of nowhere and could shatter a window. The crying jags can happen at any time; evenings are notoriously brutal, however. Luckily, there are tricks for calming the fussiest of babies and for getting through this difficult stage (and it is just a stage!) without totally losing it. Many parents assume that their colicky babies are crying from pain. But some experts, including pediatrician Harvey Karp, MD, author of the book and DVD The Happiest Baby on the Block, believe most are simply having trouble adjusting to life outside of the womb. All the lights, colors, textures, and sounds are upsetting to some newborns. Also, new sensations like hunger and gas can freak them out. Dr. Karp thinks that re-creating the in-utero experience can calm as many as 90 percent of fussy babies. Employing all five of the following strategies at once is best, he says, but you can get results from cherry-picking, too. Swaddling Even if you feel as if you’re putting your baby in a straightjacket, that cozy cocoon will prevent his limbs from twitching and help him nod off. Get the how-to at americanbaby.com/babyswaddle. Side Lying Before birth, your baby spent most of his time on his side in the fetal position. Carry him the same way now, and use the football hold as you nurse (clutch him with one arm, your hand supporting his head and his legs under your armpit). 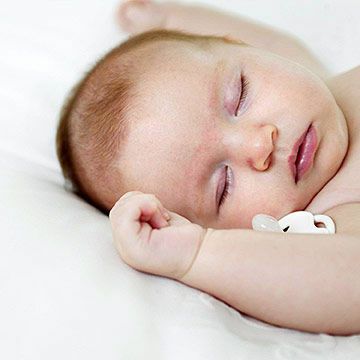 Shushing A “shhh” sound is soothing to a newborn because it mimics the whooshing noise that surrounded him in the womb. Make the sound yourself or use a radio tuned to static, an iPhone app (try White Noise or Ambiance 2.0), or a CD of white noise. Make sure the sound is louder than your baby’s cries; he won’t hear it otherwise. Swinging Fast, rhythmic movements like swinging, rocking, or jiggling might remind your little screamer of those carefree days he spent bouncing around inside you. The more agitated your baby, the more vigorous the motion should be. Sucking For a baby, sucking on a finger or pacifier can be what lying on a warm beach is for us: total relaxation. It works best after you’ve calmed him with the other S’s. It’s a vicious cycle: A colicky baby is usually a poor sleeper—and the more exhausted she gets, the more she cries and the harder she is to soothe. To help both of you get more shut-eye, create calming bedtime habits, says Pamela High, M.D., a colic expert at The Brown Center for the Study of Children at Risk, in Providence, Rhode Island. Start with a warm bath, then play relaxing music. Make nighttime feedings “all business.” Keep the room quiet, dim the lights, and don’t engage your little one. Simply feed and change her, then quickly put her back to sleep. “Babies don’t know the difference between day and night, so you have to teach them by behaving differently,” Dr. High says. To help baby sleep better at night, don’t let her nap for more than three hours at a time in the day, even if it means waking her. The thought of giving up cheese and ice cream might be hard to stomach. But with breastfeeding moms, these sacrifices can make a huge difference; some studies show that colicky babies improve dramatically when the mother removes cow’s milk from her diet. It’s worth trying for a week or so, especially if you have a family history of milk allergies or intolerance. (Nursing moms need 1,000 to 1,300 milligrams of calcium daily, so take a supplement.) Hillary Mizia, of Golden, Colorado, noticed a big change in her 6-week-old son Miles after she cut out dairy. “Within three days, his colicky symptoms went away,” she says. Over the course of his first year, she tested her theory by periodically eating a meal that included dairy. Within a day or two, “we would have a very sad baby,” she says. If you’ve tried just about everything and your baby is still screaming at the top of her lungs, she may have an underlying problem. Up to half of newborns experience reflux, a condition in which baby’s last meal comes back up from her stomach into her esophagus—and often through her mouth and onto your favorite top. In most cases, symptoms are mild; you can ease them by keeping feedings small and burping her frequently (every few minutes instead of once at the end). However, infants who spit up often, persistently refuse food, and don’t gain weight might have severe reflux. Your doctor can prescribe medicine, such as children’s Zantac or Prevacid, that keeps stomach acid from backing up or blocks its production altogether. Mother Nature can be a baby’s best friend. The whoosh of the wind or the rustling of leaves might remind her of similar noises she heard inside the womb—or simply distract her. Stephanie Gurnsey Higgins, of Richmond, used to take her colicky daughter for neighborhood walks. The outings “helped calm us both down,” she says. Fresh air is bound to work wonders for you, too. 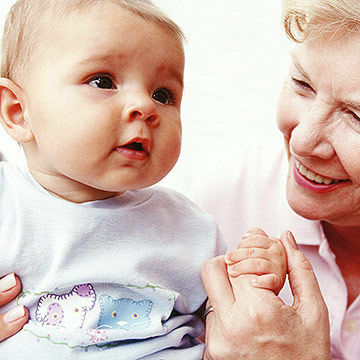 With any luck, you’ll bump into the kindly grandma who will tell you how beautiful your baby is. When friends and family ask what they can do, suggest they come over and watch the baby. Now is the time to call in favors; research shows that very anxious moms are more likely to have colicky babies. Post a plea on Facebook or have a girlfriend send out a group email to summon the troops. Don’t even think about feeling bad: Looking for support doesn’t mean you’re weak, ineffective, or pathetic. It’s smart to recognize your needs and accept assistance—and wouldn’t you do the same for a good friend? Finding time for yourself will help calm your nerves and prevent you from having a major meltdown. If your unhappiness feels more like depression, though, see a doctor (colic is also more likely to pop up in babies of depressed moms). When you can’t stop the tears despite all your efforts, give yourself permission to leave your baby alone in a safe place (such as her crib) for five to ten minutes, Dr. High suggests. Then take a deep breath and grab a snack, collapse on your bed or text your partner and tell him to get home, pronto. It’s key to take a break before you grow too frustrated, as your baby may sense your I-can’t-take-it-anymore vibe and become even more upset. Stepping away could actually help break the cycle. If you leave her alone, you might find that, after crying for a bit, she falls asleep on her own. When it comes to colic, it’s tough to know who deserves more sympathy: the miserable baby or her frustrated parents. Colic survivor Desiree Miller acknowledges that it can be emotionally devastating. “There’s nothing worse than hearing your baby cry and not being able to stop it,” says the Atlanta mom. “It left me feeling like a failure as a mother.” But rest assured that you’re not a terrible mom. As long as you’re responding to baby’s cries and doing your best to console him, you’re doing great. Remember, just because your infant is cranky doesn’t mean he’s destined to be a grump. Take Martha’s son: Now 18 months, Will is the happiest of toddlers. He’s usually sporting a wide grin and the cutest dimples. So keep your chin up, and do your best to comfort your baby. 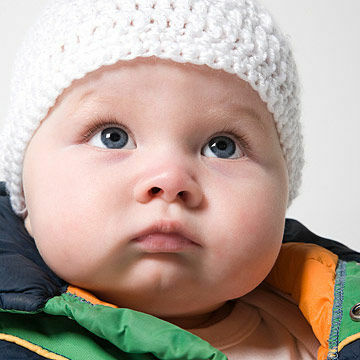 Originally published in the July 2010 issue ofAmerican Baby magazine.